This Saturday, May 5th, marks the beginning of Vermont’s walleye season in waters excluding the Connecticut River which is open year round. This annual event is long waited for many anglers in the Green Mountain State. 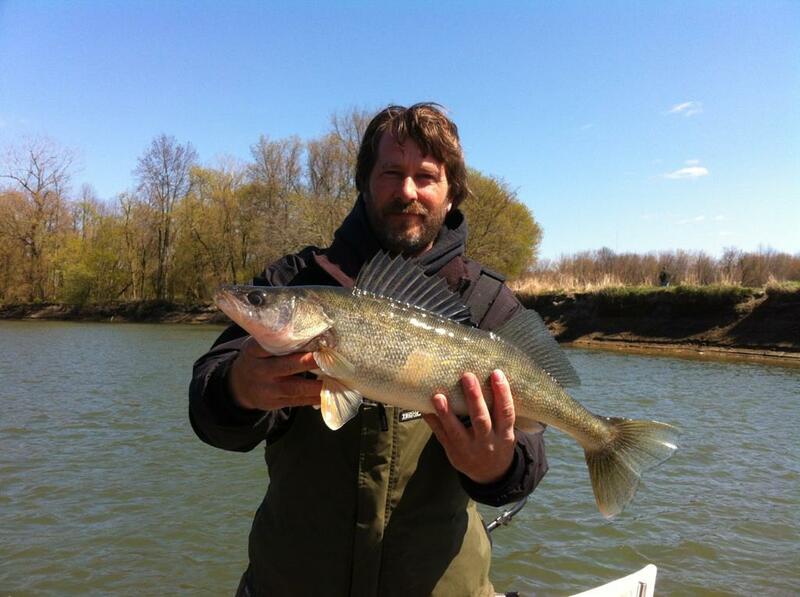 Walleye’s spawn in the spring and often times choose to travel miles up feeder rivers to lay their eggs. Lake Champlain has three major river systems on the Vermont side( Winooski, Lamoile and the Missisquoi) that see a fantastic run of eyes starting in April and May, ending the later part of June depending on conditions. This is event is so popular with local anglers that you often hear he phrase, “you could have walked across the river there were so many boats.” This is often times the case, it is nothing to see more than 50 boats on one section of the river at a given time. We are fortunate to be friends with some of the most knowledgeable Walleye fishermen in the area in my mind. Scott Blair of Vt Sportsman has helped us hone our skills with one of the most effective ways to catch these elusive eyes. It’s simple. All you need is a jig, a barrel swivel and a fathead minnow. 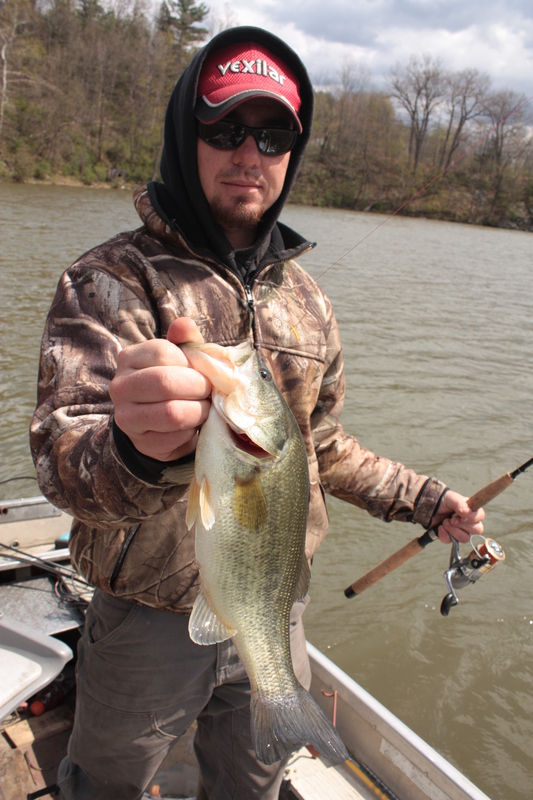 Scott uses 6lb mono with a 1.5″ leader, the barrel swivel connecting the two. 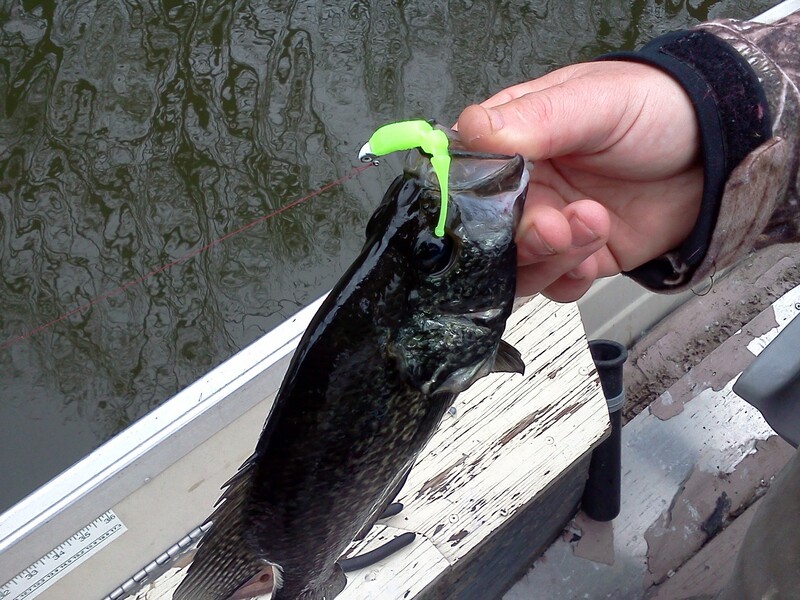 The swivel will reduce line twist while fishing in the current and increase bites. Depending on the conditions, different weighted jig heads are a must. Scott prefers to use a 1/2 oz jig head when the river has a good amount of current and he slims that down to a 3/8 oz when conditions are right. Once rigged up, Scott simply bounces the bottom. He uses his trolling motor to slowly troll up and down the section of river that he wishes to fish, jigging the minnow over the side with an up and down motion, yes your arm will be sore by the end of the day. “Once that jig hits the bottom jig it up, but slowly let the jig fall, the fish will just be there when you you feel weight, seek it and forget it!” Early season produces some high quality fish for our area, 7-10 lbers. It is not unusual to get a respectable limit (3 fish) in an outing. Another popular method used is to use the current and some sort of work harness to drag night crawlers downstream. The method will produce fish but is more effective once the water warms up later in the spring, minnows seem to work better with the early spring water temps. Good Luck out there, tight lines! After we found the crappie last night we were motivated to get an early start. We hit the road at 4am with a chill in the air headed for the Connecticut River. 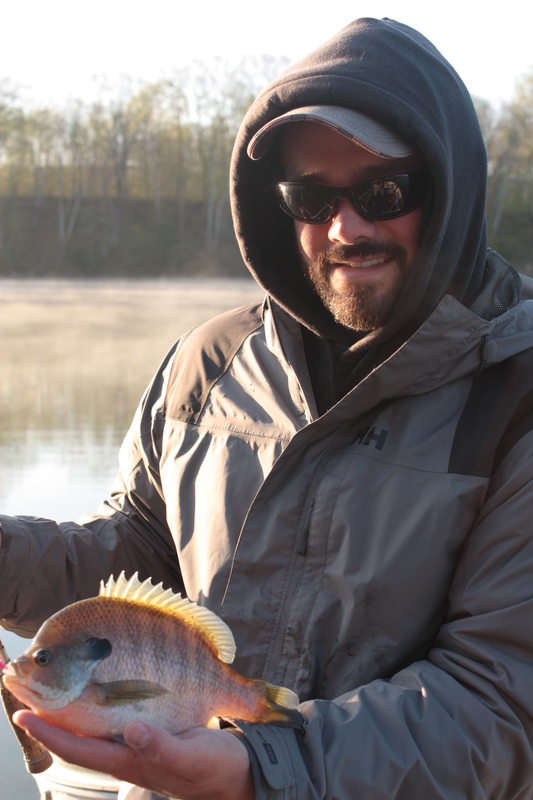 The air temperature at the boat launch was 31 degrees and the water temp at the first fishing spot was 52 degrees. Another curve ball for us to figure out to understand the days strategy! We fished the honey tree from the night before with no bites so we headed to the next two spots with the same results minus one smaller fish. Every spot that had produced the few days prior were fishless. We decided to fish a small flat that we had found a few fish on a trip earlier in the week. Right off Bobby caught a crappie so we got excited. 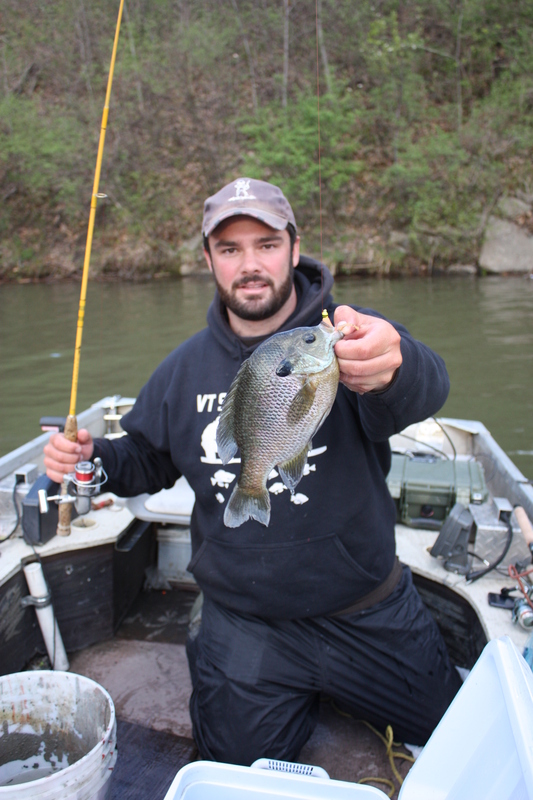 Over the next 45 minutes we caught quite a few more bluegill including one 10.5″ with a big bull head and a solid pound of muscle. The fishing slowed again and we trolled around searching out fish. Because the only productive aspect of the day at this point was the ice building in our guides, we decided to head and get in the sun regardless of how the fishing would be. 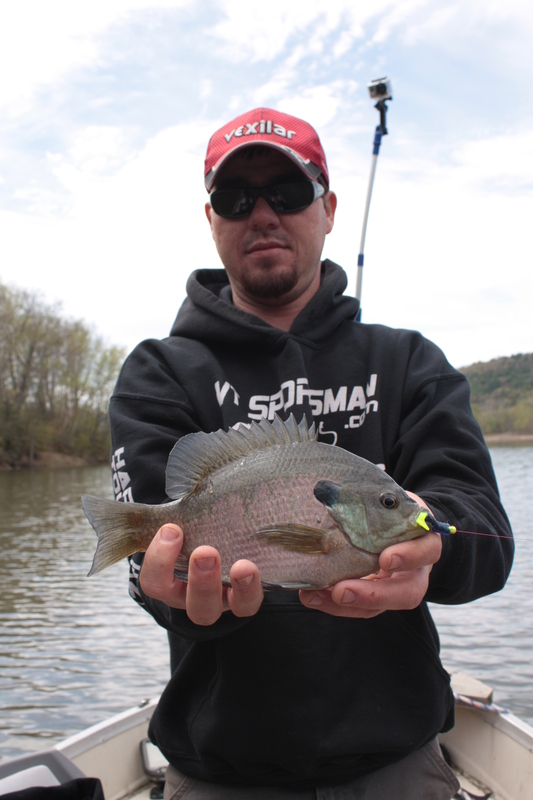 We had caught a few bluegill earlier in the week in this location so what the heck we gave it a shot. Worst case scenario, we would warm up! We fished for about a minute before I caught a fish. It was a gill. We had a slow drift going on in water that was slowly warming. We hit 54.6 degrees in shallower water maxing out at about 5 feet. 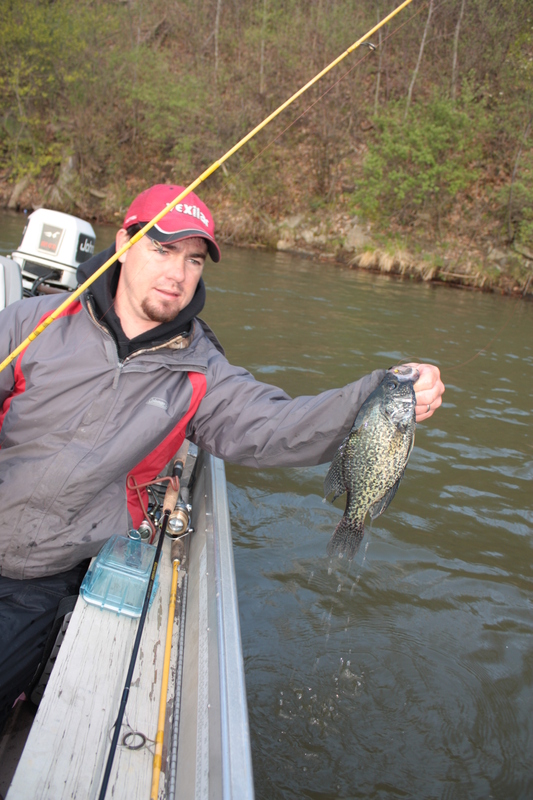 As we crept along, I pulled the second crappie of the day. A solid 12″ male in no mans land. There was no structure and limited weeds nearby but we anchored anyway. 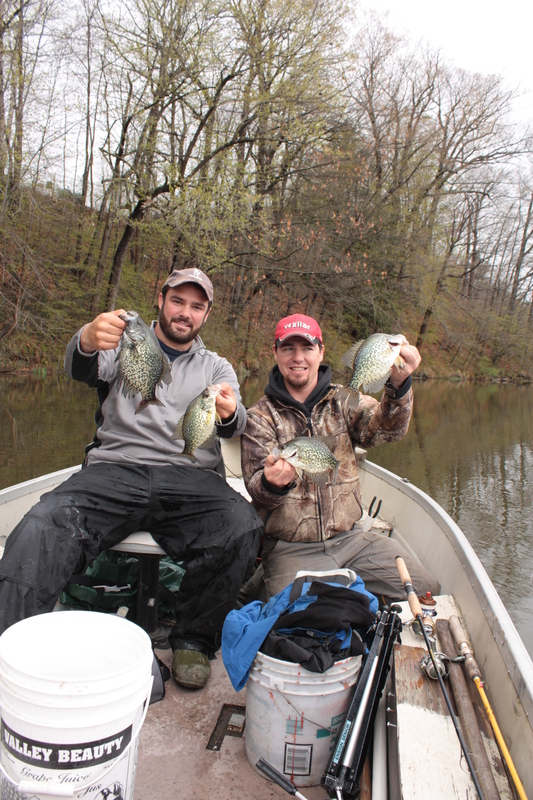 We ended up catching quite a few gills there so we utilized the same strategy for the rest of the sunny shore line. Drift till we locate fish by casting parallel with each other towards shore, then anchor up, and fish till they stop biting. 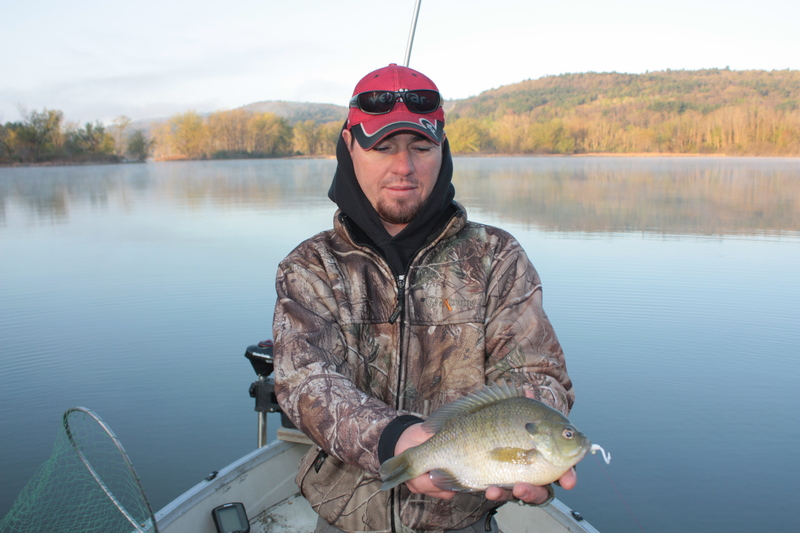 The shore produced quite a few big bluegill and the only pumpkinseed of the day. We could see the sun rays hitting the spots we normally fish so we motored down thinking the fish may be biting. We found the same results as earlier. Nothing. We went back and forth for a while searching out active fish in hopes that the warm sun would turn them on. It took a while but we got into them in one of our spots but they were loyal to the shade. Rather that being in the sun like we expected trying to warm up, we caught the majority of the fish as we worked our cast out of the sun and into the shade. Exact opposite of the other side! With the water temperature now at 56.2 degrees, we were surprised but went with it. We fished the same spot a few more times and it was the only spot that produced a good concentration of fish all day. 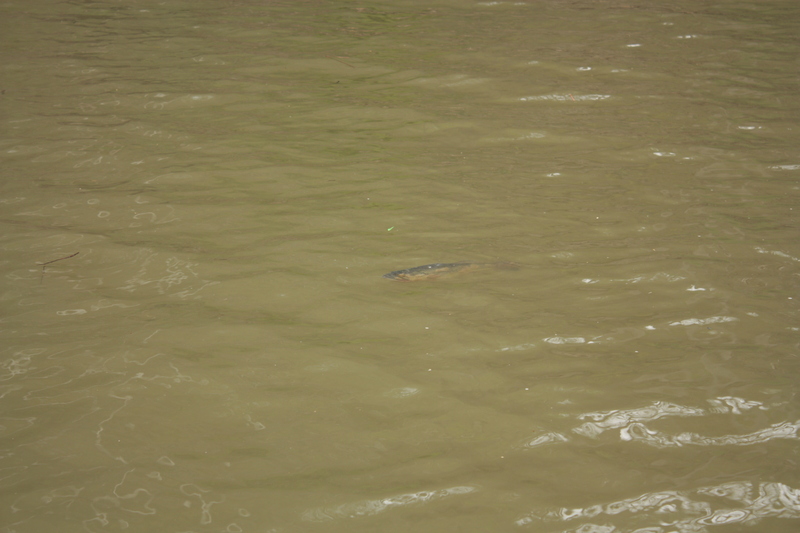 It was funny to us that the fish were doing such opposite things in the same small section of river. With the water being fairly cold we expected the fish to, 1) be relating heavily to structure as it warms up faster and 2) be positioned in the sun as the shaded water was colder all day. Either way, we adjusted our fishing techniques according to the fish patterns. At the end of the day, we snapped some pictures and returned the majority of the fish. I kept a few for a meal that night and was surprised to find that they were all spawned out. Both the males and females that I kept were void of eggs and milt! 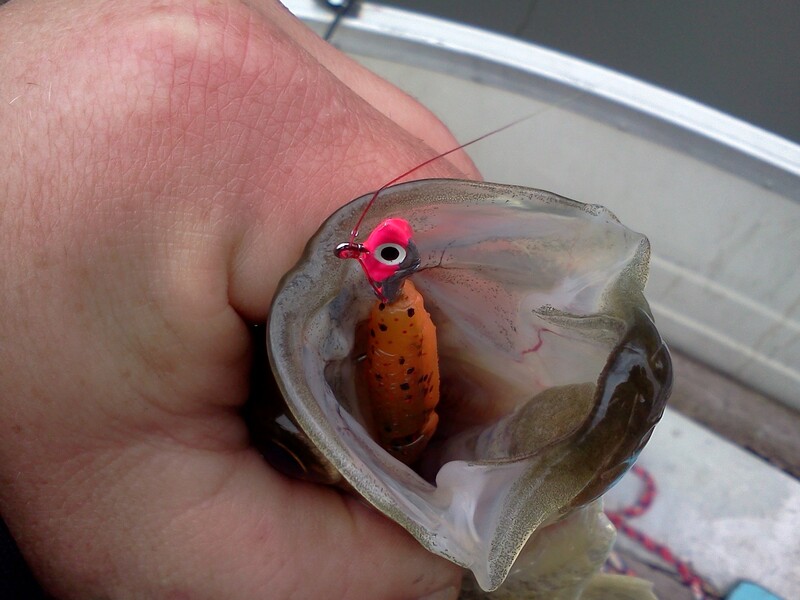 The main bait used again today was the “Live” Baby Shad by Lake Fork Trophy Lures. We fished all colors today because the bite was slow and we were trying to figure them out. The best color today was anything that had chartreuse in it. The bite today was best when the bait was fished fast but a bit slower than the previous days. The harder the bait bounced, the better the fish would bite! 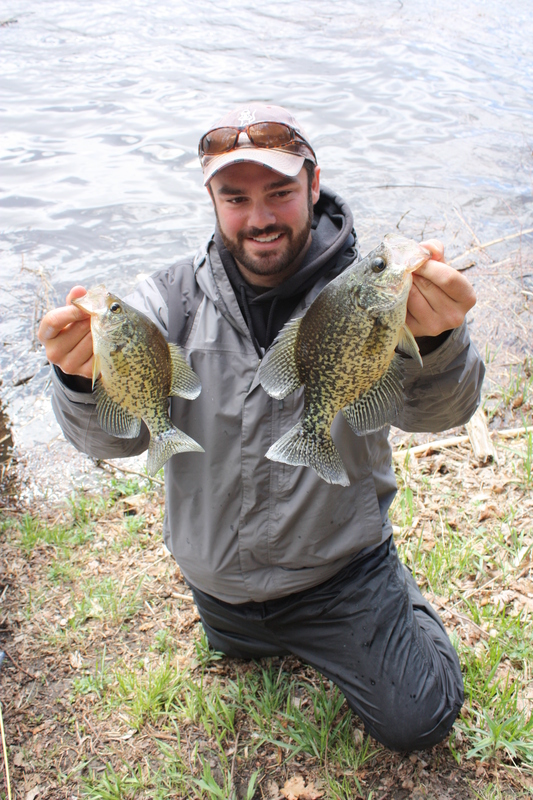 On the way home from yesterdays trip, we made plans to fish a small inland pond that holds some decent bass and crappie but neither of us could get the giant bluegill and crappie from the Connecticut River off our minds. When we met up this morning both of us were like “lets go to the river!” After fixing a few issues with the boat and checking the weather, we headed out. The report was partly cloudy with winds in the low teens out of the south west. Less than ideal conditions for the section of river we were hitting but we knew the fish were there. We got on the water a little after 10am. The chop was more than expected and the water hadn’t cleared up at all. Uh oh…. We motored in finding the water had cooled down into the low 50’s and the warmest it got all day was 54 degrees. Regardless, we began fishing but had to work hard for the fish we got. We fished the two main spots we had been catching fish at and managed to pull a few. 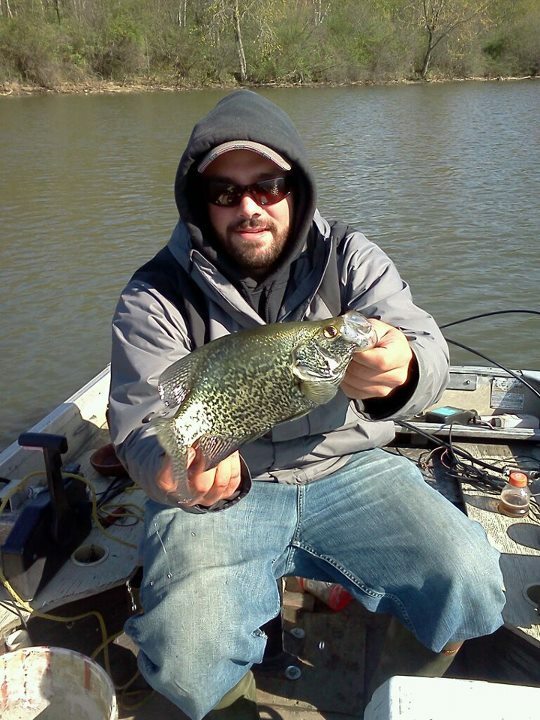 Mostly bluegill but a few crappie. We worked back and forth looking for the fish but couldn’t find good numbers of them. We worked over all the submerged structure we knew of and through the channel. The fish seemed to be very good at eluding us so far! Everywhere we went, we had to drop the anchors in order to stay put until a big gust would move us on unwillingly. It seemed to be more frustrating than the quality of fishing was worth. After a slow day of fishing, Bobby gave me permission to choose one more spot before motoring back to the launch. We had a 4 o’clock deadline to leave because of prior commitments. 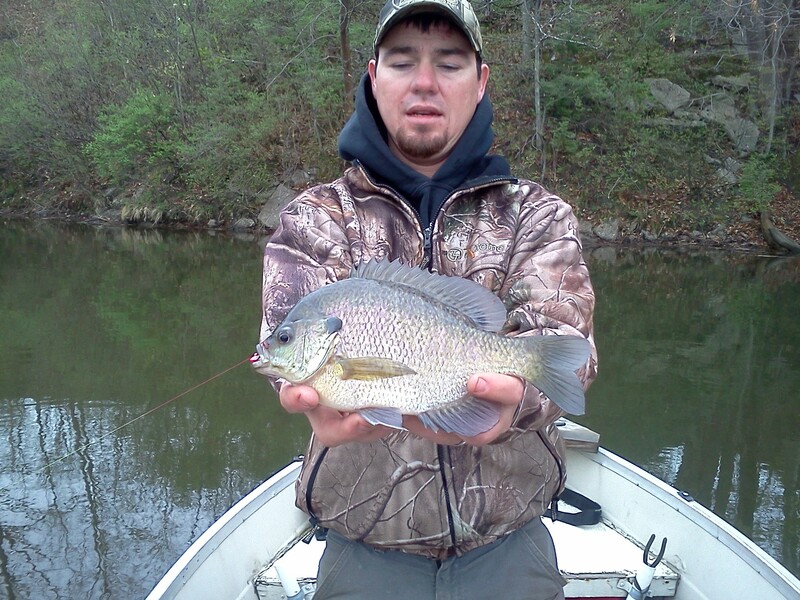 I chose a tree that held two nice bluegill the day before but hadn’t produced anything yet on this trip. Bobby was less than impressed with my choice but agreed because he thought it would be a quick pit stop. The first cast on the tree gave up a crappie so we dropped the anchor. After a few more casts we realized there were a lot of fish in this tree and we needed to reposition. As we hoisted the anchor to move, we realized that the fish were holding on submerged tree branches we couldn’t see. A large section of the tree came up on the rope so we untangled it and dropped it back down as stealthy as possible. We backed out slowly and set the anchor so that we could efficiently fish the entire area. We fished the visible parts of the tree and all the water surrounding. We were able to determine that the diameter of the sunken tree reached far more water that previously imagined. We snagged into remnants of the oak crown several times pulling fish in. Knowing that this tree was big, we cruised around and tried to get a bearing on where else there were parts of the tree. After putting another 12 nice crappie and a few gills in the boat, we packed up to head home. We fished pretty hard today but didn’t get much for results until we were beaten up and ready to head home. We spent a lot of time today hoisting and dropping anchors, motoring around to get back in a decent positioning, and reeling in wind drifted casts. Even though the fishing was slow we caught some real nice fish. 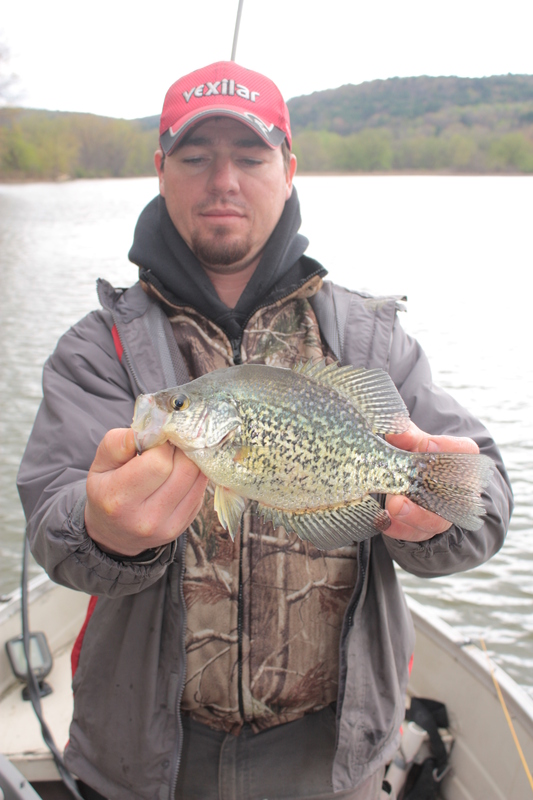 One crappie weighed 1 – 3/4 pounds and a few bluegill were just under a pound. I am glad we didn’t give up and never underestimate the power of “one more spot”! Mainly, we fished “Live” Baby Shad by Lake Fork Trophy Lures today after their great productivity the last few days. The best color today was anything dark. The clouds gave way to some sunshine towards the afternoon and the dark baits must have silhouetted better against the stained water. 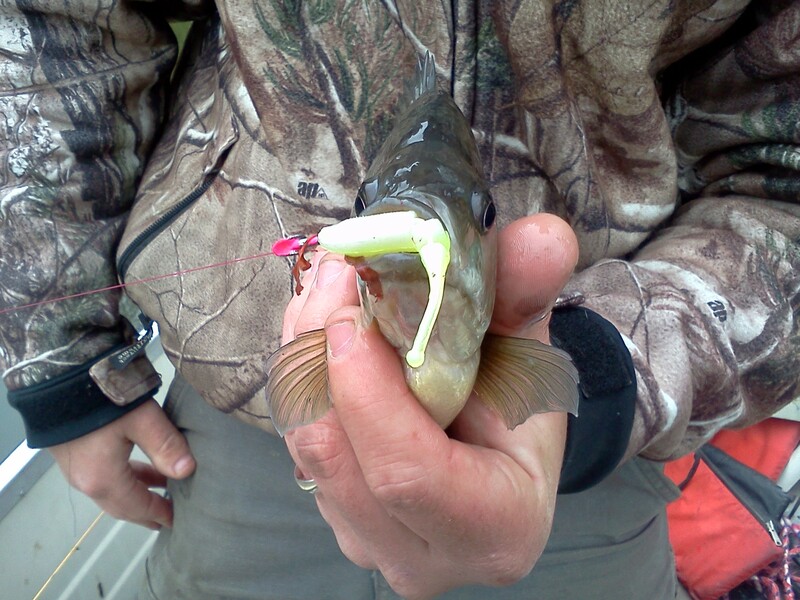 Once again, the fish liked the baits moving along quickly popping constantly under a bobber. I think after this afternoons discovery, we will be back early tomorrow morning! As we were catching fish earlier in the day, this sick looking bass came in and we notice the fish bite slow. Once the bass moved on the fish turned back on. This scenario played out several times throughout the next hour. The panfish really didn’t like this bass! 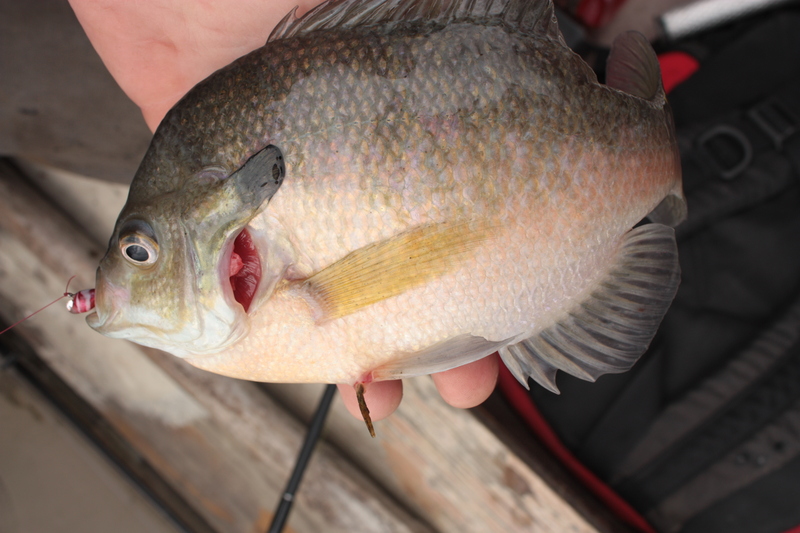 Check out this fish with a partially missing gill cover and a stick protruding from its belly! We went fishing the Connecticut River today. In order to get on the water, we had put in a bit of work. We carried a small rooftop boat through the woods as the spot isn’t accessible by even a shallow motor boat. The conditions weren’t ideal for the type of fishing we were capable of doing from this boat. The wind was whipping and the water was about 5 feet higher than normal and was very muddy. Even with an anchor, staying in one spot was a chore. We fished for about 2.5 hours before calling it quits and getting the big boat for some more river fishing. All the bites we got were while the bobbers were sitting still. The waves pushing through the open areas kept the jig bouncing enough to entice the fish that we did catch. The only action we gave the bobbers was as we reeled it in slowly. Before we left, we were able to catch a few fish. 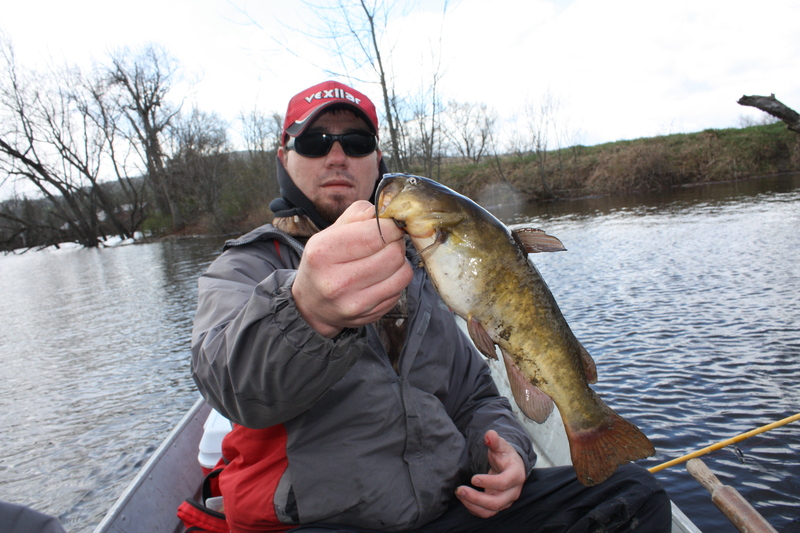 Bobby yanked this nice bullhead suspended in 15 feet of water about 5 feet down. It gave a good fight and totally surprised us as it rose to the boat. It was the first time we have caught one of these in the hole we were in! 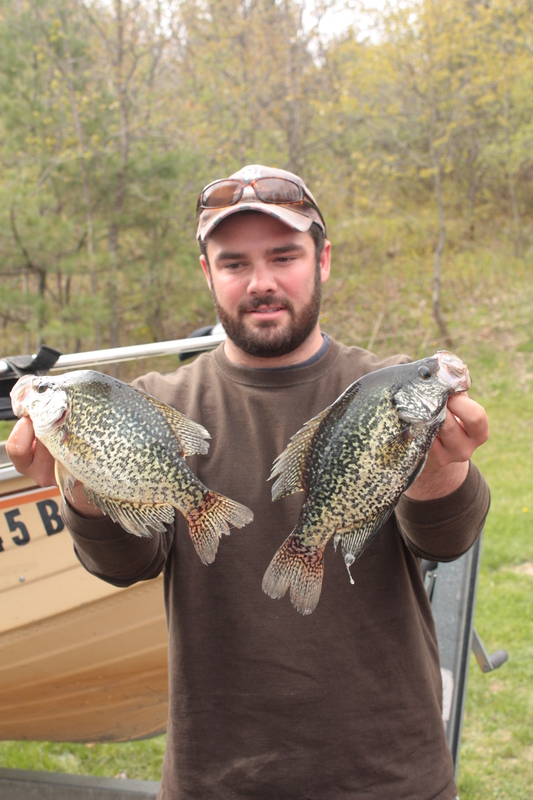 Between the two of us we were only able to catch three crappie. Two were decent around 10″ and one was a solid 12″ fish. We arrived at our second spot on the Connecticut River right around 3pm for the evening bite. The conditions were decent with a slight chop on the water and overcast skies. The water was about two feet higher than it had been the last two days and the water was quite a bit more stained as well because of the recent rain. 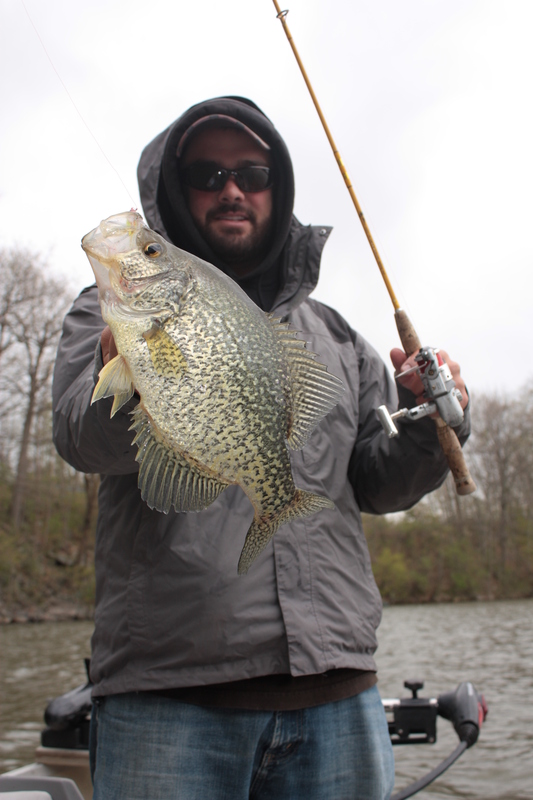 We began by fishing the spots that had been producing in recent trips and not much had changed. The fish were still close to shore but not holding as tight to structure as they had been. 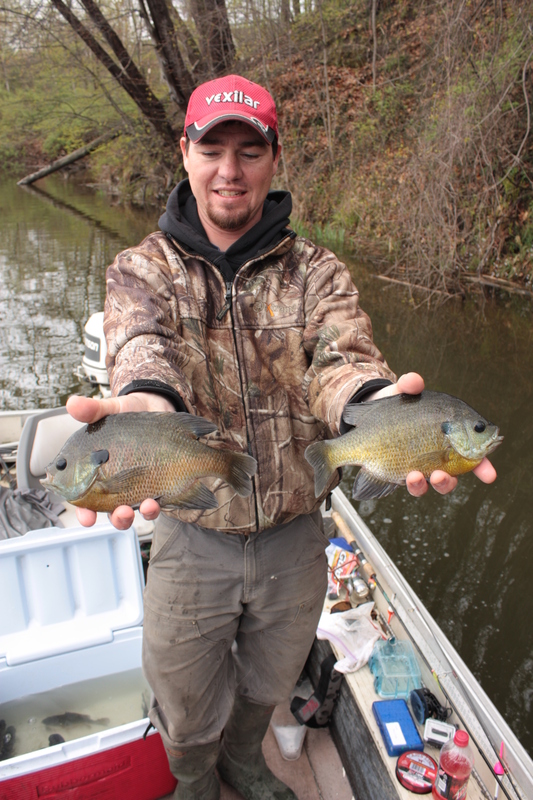 We proceeded to catch some big bluegill and a few decent crappie on “Live” Baby Shad by Lake Fork Trophy Lures. As opposed to recent trips, natural colors were much more productive but we still managed a few on the bright colors. We mainly used “carolina pumpkin/chartreuse pepper” and “sun perch”. As usual, we fished these plastics on smaller ice fishing jigs under a bobber twitching them vigorously on the way back to the boat. The majority of the bites came as the bait moved but some were taking it during a pause so it was important to vary the retrieval speed. By the end of the trip, we had put quite a few nice fish in the live well for some pictures before release. 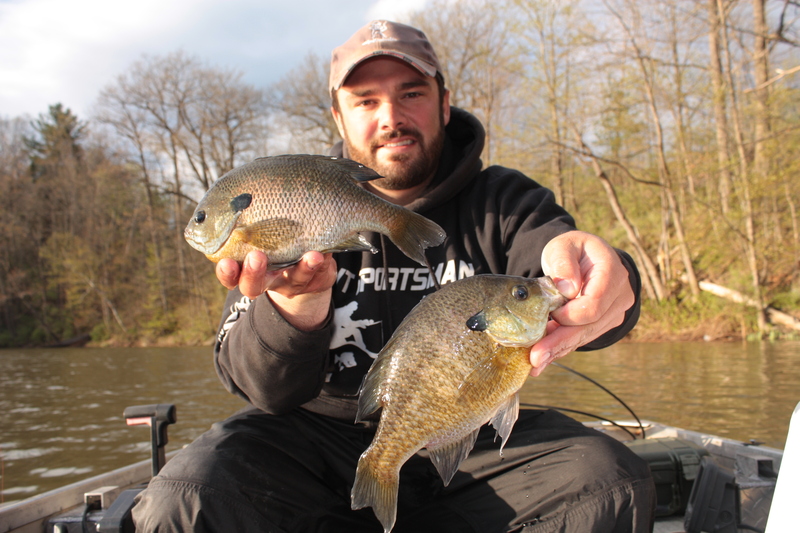 Two of the bluegill weighed in at an even pound and several others were just shy. 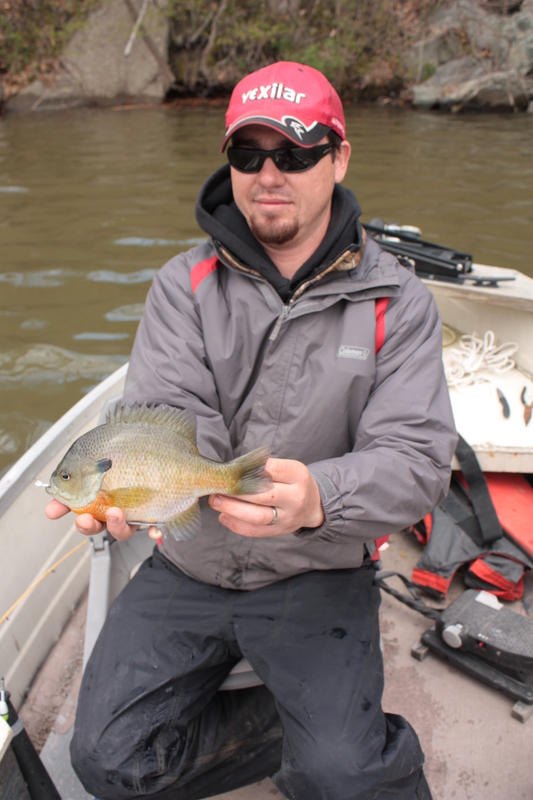 Nine of the gills were over 10″ and three were 10.5″. 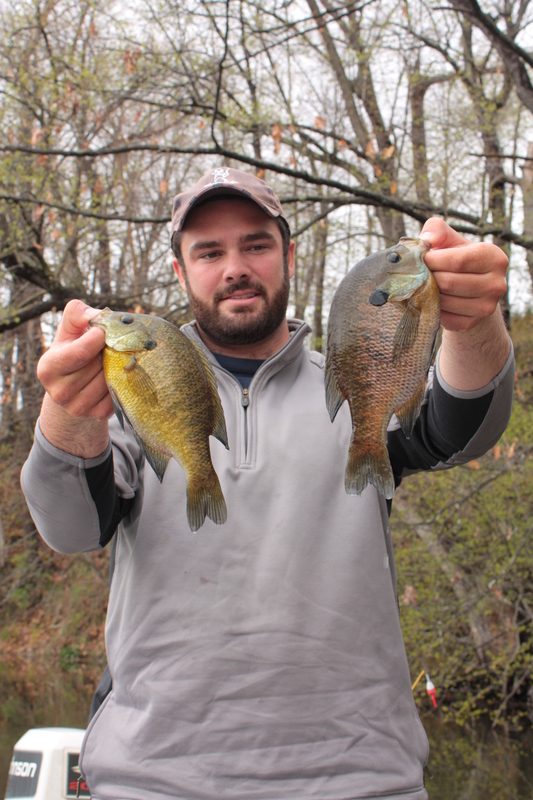 None of the bluegill caught today were under 7.5″. Its true bigger baits catch big fish! After a report like yesterdays, I couldn’t wait to get on the river with Bobby and Mark this morning chasing those big Connecticut River crappie! The few rivers that we crossed this morning on the way to the launch had our nerves working overtime. The water looked like chocolate milk and was flowing fast. We didn’t dare check river gauges this morning because we thought we thought it would scare us out of wanting to go. We figured it would be better wasting a day on the river than at home twiddling our thumbs. Upon arrival, the current was faster than normal but the water still had some clarity to it. We packed the boat for the days trip and lunched it quick. The water in the main flow was a cool 49 degrees. As we made our way out of the current, the water warmed and we ended the day hitting close to 57 degrees. We figured we would try the productive spots from the day before first so we motored right in. It didn’t take long to realize the fish had moved. We fished shallow and deep but nothing seemed to trigger the fish. 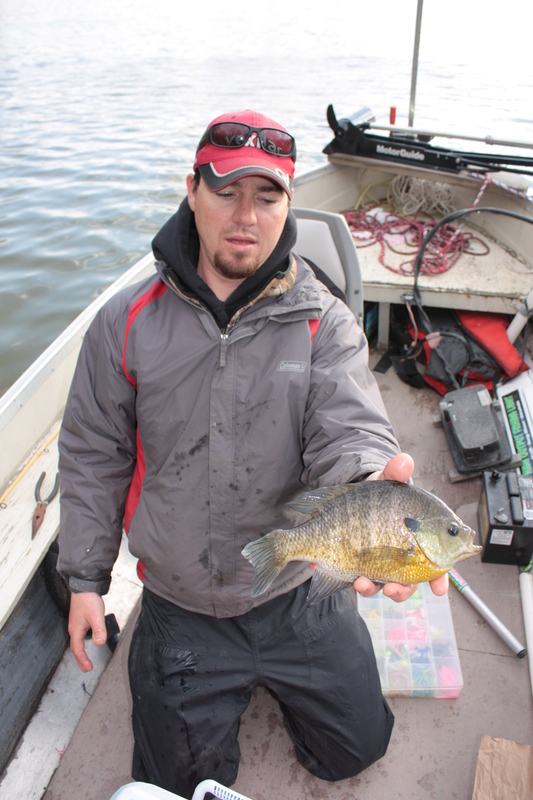 Between the two spots that were good yesterday, I think we caught one decent bluegill. Not knowing exactly what to do next we adjusted our bobber depths trying to find the right depth. 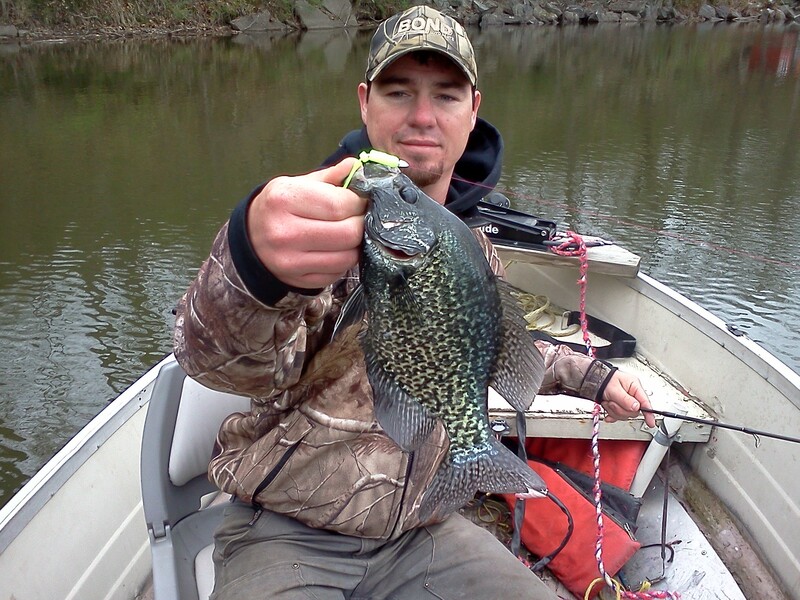 We worked the shore line quite a ways until I hooked into the first crappie. It was a decent one. Right around the 11″ mark. I pulled this one suspended 2.5 feet down in 5-6 feet of water. The key to the location was an inside turn in the main channel off a main point.The fish were cruising through the channels today, mainly in 8-9 feet of water and this turn was a natural corridor where two channels converged. The fish threw us for a curve after being so shallow yesterday and relating to structure. The drop in water temperature really screwed with the fish patterns in the past 24 hours! Throughout the rest of the day we would work this spot until the bite died and move on but then return when we thought the fish had recharged. Because of the location we caught the crappie, we figured we should fish another inside turn that was much more gradual with more weeds adjacent. The area we were fishing was wiped clean of weeds last year between the two flooding events that hit the northeas. We began fishing the turn and it didn’t take long to get on the fish. We found them to be a bit shallower. We had our bobbers set around 4 feet but the fish were holding in 4 feet of less. After a slight adjustment, we were all cranking on them. We were tossing back gills that would be trophies on most bodies of water around the state! If you can find a pod of these guys on the river you won’t be disappointed! 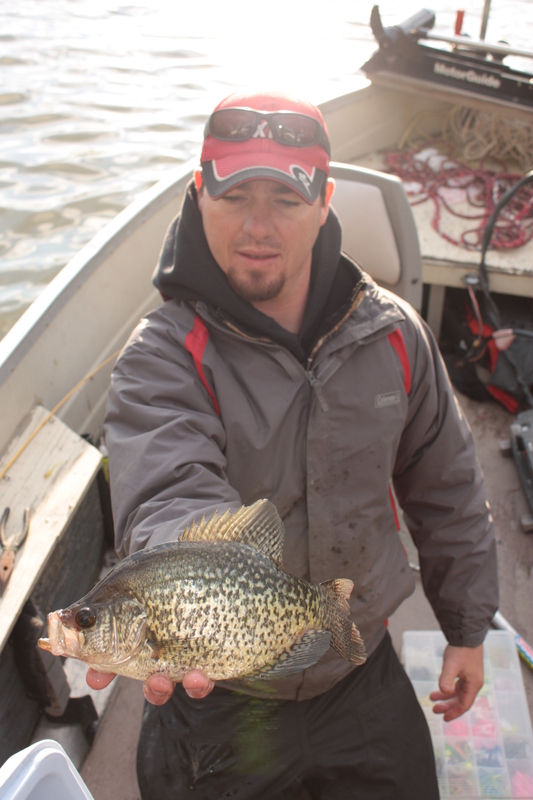 Even though we didn’t get to pound on the crappie, we caught some nice ones. Of the 10 total that be got in the boat, eight were 9″ or bigger. 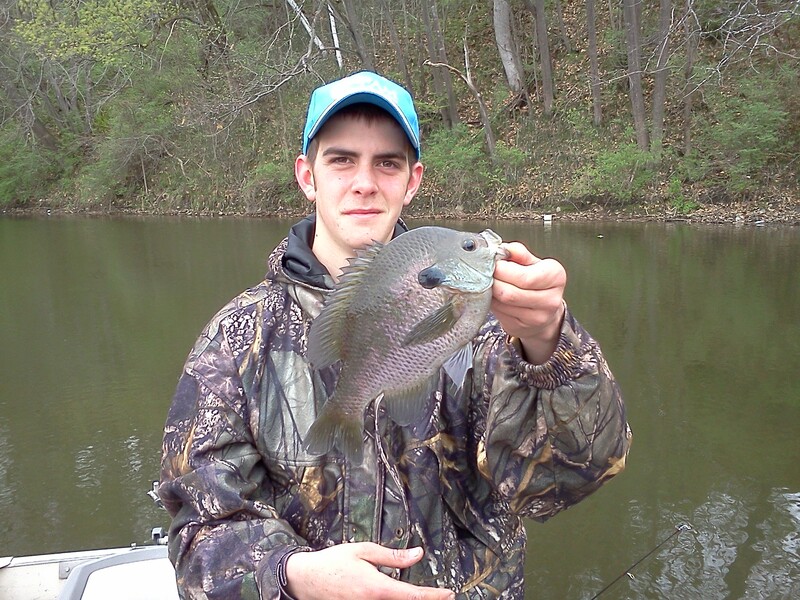 Bluegill on the other hand were crazy! In the days honey holes, it was one right after another. I don’t think we caught any gills under 7.5″ with the majority being 8″ or better. Several were 9″ or better and a few were in the 10″ class. 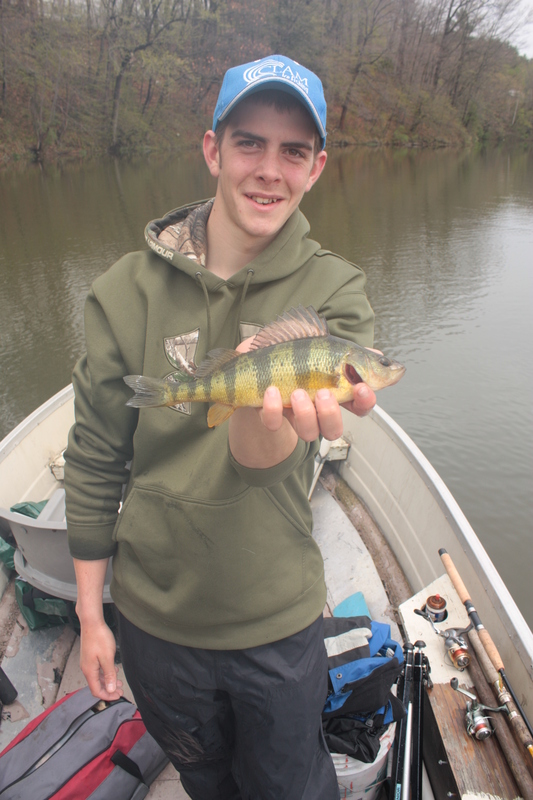 We also caught a few perch, bass, and one lonely pumpkinseed! Once again, we had the majority of our success today on the Lake Fork “Live” Baby Shad. Chartreuse was a good color choice today as well as “Hot Cricket”. The fish were a bit more picky but as long as the bait was bouncing, the fish would attack it when you found a pocket of them. It took a while to find a school that was worth sticking around for though. I hit the water this morning with my buddy Mark to fish the Connecticut River. The fishing was good once we found a few pockets that held fish. The water temperature maxed out at 61 degrees in the calmer water. The fish were relating to structure very tight and as long as you didn’t hook into the woody debris, the fish held tight. We found a pattern that once we did hook into the trees that held fish or even bumped it pulling one in, it took about 20 minutes for the fish to return. 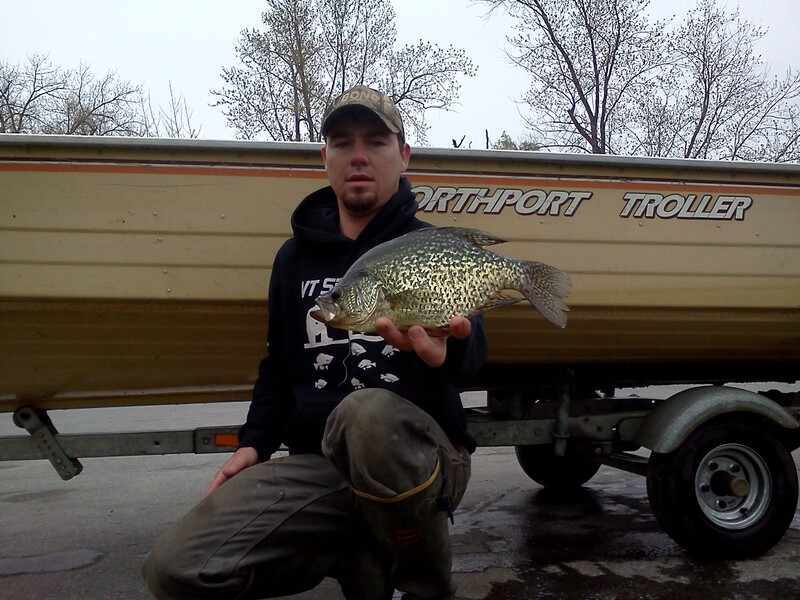 We had two spots on a northern turn in the section of river we were fishing that were about 75 yards apart that were packed tight with fish; mostly crappie. We found a distinct size distribution separation between the two. On one hand, we could jack crappie after crappie that were less than 8 inches or we could chose to get fewer bites from quality fish. We picked the best of both worlds. Fish one hole until we spooked the fish and then putt over hit the other. The cycle worked well. 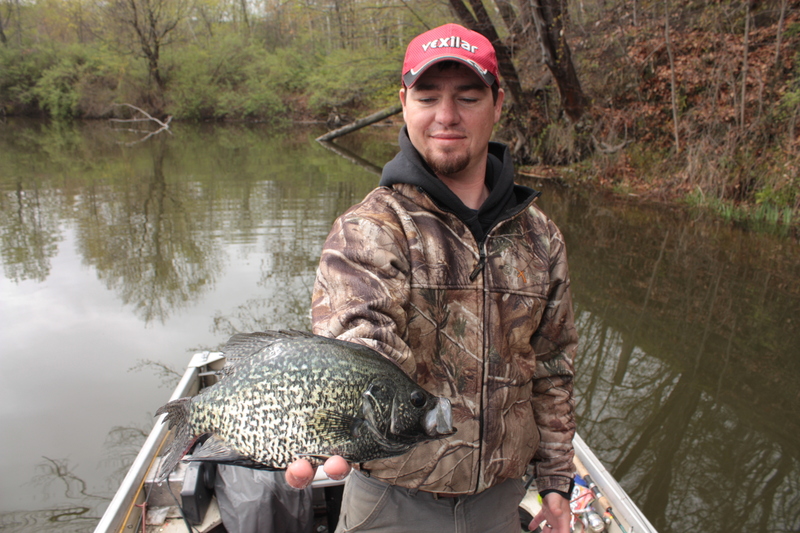 We caught well over 100 crappie and some bull bluegill. Two gills were 10.5″ on the dot! It was the first time I can remember catching crappies this dark in coloration. It’s like what you see coming from southern states! We spent the majority of the day casting with the “live” baby shad by Lake Fork under a bobber. The hot ticket color was chartreuse for the bigger fish but we found that any color combination for jig and plastic was working. We were just on fish. The deal breaker for catching fish today was to work it fast. Popping the bobber up and down around brush and other submerged structure drove the fish nuts. Back at it in the morning. It’s suppose to rain throughout the night so we will see how the cooler rain water changes the bite! Registration/Check Station:Deadline for registrations is 4pm, Friday, May 18th.All teams must be at Pelkey’s Archery Inc. no later than 2pm on Saturday May 19th for final weigh in. Pelkey’s Archery will take care of all fish disposals! All contestants must register before shooting. You must shoot your own fish. Registration will end at 4pm on Friday May 18th. All fish must be harvested on Lake Champlain. Fish entered must be shot alive. This is a carp only tournament. Final weigh-in is at 2pm at Pelkey’s Archery. All fish must be at Pelkey’s Archery by 2pm to be eligible. No shooting on tournament waters 24hrs prior to the start of the tournament. Compound, recurve, and longbow are eligible as long as there is a reel and line attached to the arrow for retrieval, no crossbows allowed for this tournament. Fish entries must be taken with compound, recurve or longbow and single point arrow only. No fish points/arrows with explosives or other shocking devices will be allowed. All arrows must have a line attached to it for retrieval. This line must be attached to a reel on the bow. No snares, no dip nets, and no gigs will be allowed in boats. Reported transferring of fish between teams will result in disqualification of all teams involved. At no time is one team’s fish to be placed in another team’s boat. No baiting or chumming of fish. No unsportsmanlike conduct will be tolerated. Teams will keep a minimum of 25 yards whenever possible. Rules committee reserves the right to disqualify or reject entrants. All decisions made by the committee are final. Failure to comply with tournament rules will result in disqualification and entry fee WILL NOT BE REFUNDED. Tournament hosts and sponsors will not be responsible for accidents or lost property. NO AUTOMATIC REFUNDS OF ENTRY FEES. Fees or any portion of fees refunded will be the decision of tournament officials and will be based on reason of cancellation. Alcoholic beverages are PROHIBITED in boats during tournament hours. Firearms are PROHIBITED during scouting and tournament hours. Identification of persons participating is required upon request. Tournament boundaries will be Lake Champlain only! Release forms must be signed and on record for each participant of a tournament. A formal protest fee in the amount of $50.00 must be made to officials and posted prior to the awards ceremony. The protest fee will be refunded if the protest stands valid. Tie-breaker will be length, then by girth, and if tie still exists, b date/time fish was weighed in. All carp entered will be weighed, measured, recorded and marked. Participants will be required to sign the record card as an acceptance of the recorded measurements. All carp entered will be washed prior to weigh-in and are subject to inspection. It is the responsibility of tournament participants to know and obey state and local Fish and Game and Boating Laws. Any violations will result in disqualification. All contestants are responsible for obtaining licenses or permits required by the state.